Wazungu was a Swahili word to describe white explorers in the 19th Century. It wasn't a word related to their skin colour, but meant something strange and frightening, testifying to the impression explorers gave with their bizarre appearance and terrifying weapons. Wazungu is also the term used for the explorer figures in our game Death in the Dark Continent, where they can either be part of a Native army or form their own Explorer army. From left to right: H.J.Stanleigh, a violent and brash American, followed the trail of Reggie Bunter into the Congo. He never found a trace of Bunter, but answered the tribal warcries of 'Niam, Niam' with pounds of hot lead, blasted into the jungle until there was silence, smoke and shattered greenery all around him. The Hunter, a little known and much feared character, described by the Nairobi Worthies as 'a right nasty piece of work'. Dedicated to the hunt, his reputation for killing everything he set his sights on was famous, though perhaps the time he 'allegedly' turned a maxim gun on a herd of 100 Elephants ranks as his most infamous moment. Reginald 'Reggie' Bunter, one of the most unlikely and ill-prepared explorers to enter the Dark Continent. Disappeared in the Congo, his surviving porter reported he last saw him surrounded by cries from the jungle, 'Niam Niam'. Freddie Seelow, famed Elephant hunter and friend to Africans. His favoured garb when in the bush was just his shirt and a pair of soft shoes, with his treasured and trusty Elephant gun. Unhindered with pants, Freddie could race after his wounded prey through the bush for miles to administer the final shot. (You could also use Freddie as an explorer defending his camp at night, dressed in his night-shirt after leaping straight out of bed.) 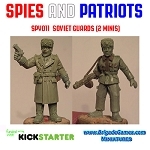 Four figures, 28mm sized, made of metal, supplied unpainted.